The all-knowing expert or team learning? Have you ever, as an adult, attended a workshop or training programme in which you were treated as a naive student? Where the 'all-knowing expert' tells you what to think - and the right way and the wrong way to do things? And the 'right' beliefs to have? And when you can speak and when you need to remain silent? I have and it's a quite common experience. And it's usually a sign of an inexperienced or insecure trainer. They need control of the group - rather like a traditional school teacher. Me, me me or You, you, you? But it can also be a sign that the presenter believes that educating adults is about performing for and impressing passive and adoring 'students': they have an act to put on and don't want to be interrupted when they're in full flow. Both styles are patronising and they place the learners, sorry - the 'students', in a dilemma. They have attended the training programme because they want to learn something. They can stay and endure the patronising - in the hopes that they will learn despite the presenter's style. Or they can leave (hopefully with a full refund) and begin searching for a more skillful trainer. Since Pegasus NLP began in the 1990’s the theme none of us is as smart as all of us has been introduced within the first 30 minutes of every NLP Core Skills course - and then continues as a background attitude throughout the five days of the course. Team learning is a fundamental part of how we in Pegasus perceive and relate with people attending courses. Yet it’s not the thinking that prevails in most NLP courses and events because for most of it’s 45-year life NLP has been "expert led". Which is a pity since in the early days the let’s develop and evolve these ideas approach produced most of what we today call NLP! The expert-led approach contradicts a key theme in real education. The root word of education is the Latin "educare" which means to draw out or lead out. Real education respects the capabilities and skills and beliefs/values which learners bring to the learning session. And, importantly, it also respects and often incorporates their life experiences. Here the role of the course leader becomes that of learning facilitator, or even agent provocateur. Their role is to encourage the learners to integrate the new material with their own model of the world to produce something far richer than that which results from expert-led learning. 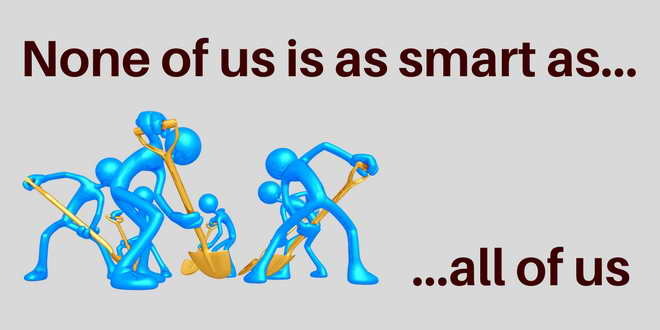 In education the benefits of the "none of us is as smart as all of us" approach in education are numerous (try a Google search on "educare"). That said, in a society which adulates "strong leadership", using the facilitated approach is a high-risk strategy. The majority of people prefer clear and immediate answers to their questions. They want clear instructions which they can follow – or reject. They do not, at first, want to be made to think – hence Bertrand Russell's observation most people would rather die rather than think! If you do not provide predigested, ready-made thoughts or ideas or answers you could provoke dissatisfaction and criticism. The facilitated approach also encourages people to be proactive rather than passive learners. So it can result in groups disagreeing with the you - something which can occasionally require a degree of state-management on your part facilitator. Respect, recognition, reassurance and responsibility need to be in place. Without these most people will simply not take the risk of engaging in exploring with you. (Old school-anchors of being made to look silly can kick in). This is walking the talk of both the two NLP Principles "the map is not the territory" and "respect the other person's model of the world". However the right-answer attitude is pretty deeply ingrained in most of us having had it drummed into us at school. Let people know what to expect. When people come to your coaching session, team or management meeting, workshop, etc tell them in advance that things are going to be different. Be prepared to allow silence. People need time to digest what you have before the answer or come up with ideas and suggestions. So allow silence while they do this. Be prepared to endure silence!